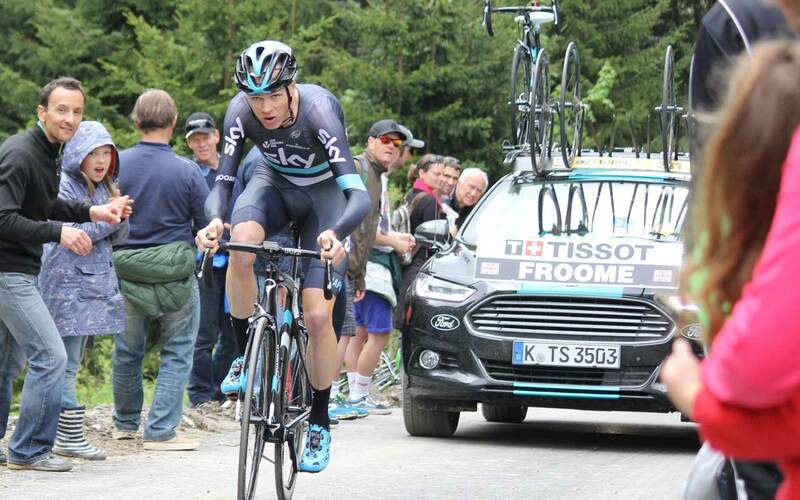 ‘On the 5th June 2016 the worlds greatest road cyclists including Chris Froome (Team Sky), Alberto Contador (Tinkoff Team), and Fabio Aru (Astana) took on the lung busting 3.9km long time trial section of the Criterium du Dauphine race in Les Gets. At the start of this 1147 kilometre world tour race the riders arrived with fresh legs ready to ride against the clock. With an average climb of 9.7%, peaking at 22% in the middle stages and finishing with the last kilometre above 15%, this is a challenge that is guaranteed to get even the best athletes sweating! We watched the action live then jumped on our bikes so we could compare our time against the pros’ – the result was worrying! The race was created in 1947 by newspaper Le Dauphiné libéré to promote its circulation. After World War II, as cycling recovered from a universal five or six-year hiatus, the Grenoble-based newspaper decided to create and organize a cycling stage race covering the Dauphiné region. The race was named after the newspaper and set in June, prior to the Tour de France. Polish rider Edouard Klabinski won the inaugural edition. 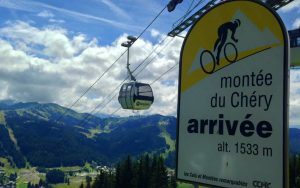 The event and the race has also served as a test for both bike manufacturers to test advanced equipment and for TV broadcasters preparing for the Tour de France, as TV coverage is a specialist skill in this mountainous region. In the 1990s the race was categorized as a UCI 2.HC event, cycling’s highest-rated stage races behind the grand tours. In 2005 it was included in the inaugural UCI Pro Tour and in 2011 in its successor, the UCI World Tour. The Critérium du Dauphiné is the only race that was won by all the quintuple winners of the Tour de France, namely Jacques Anquetil, Eddy Merckx, Bernard Hinault and Miguel Indurain. Nine racers have also won the race and the Tour de France in the same year: Louison Bobet in 1955, Jacques Anquetil in 1963, Eddy Merckx in 1971, Luis Ocaña in 1973, Bernard Thévenet in 1975, Bernard Hinault in 1979 and 1981, Miguel Indurain in 1995, Bradley Wiggins in 2012 and Chris Froome in 2013 and 2015. The Dauphiné is raced over 8 days in the Rhône-Alpes region in the southeast of France, traditionally covering portions of the French Alps. The race has often, but not always, started with an opening prologue on Sunday. 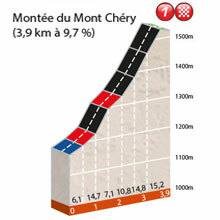 The Monday and Tuesday stages are usually held in the lower hilly regions of Rhône-Alpes, before addressing the high mountains in the second half of the Dauphiné. Often there is one long individual of team time trial included. 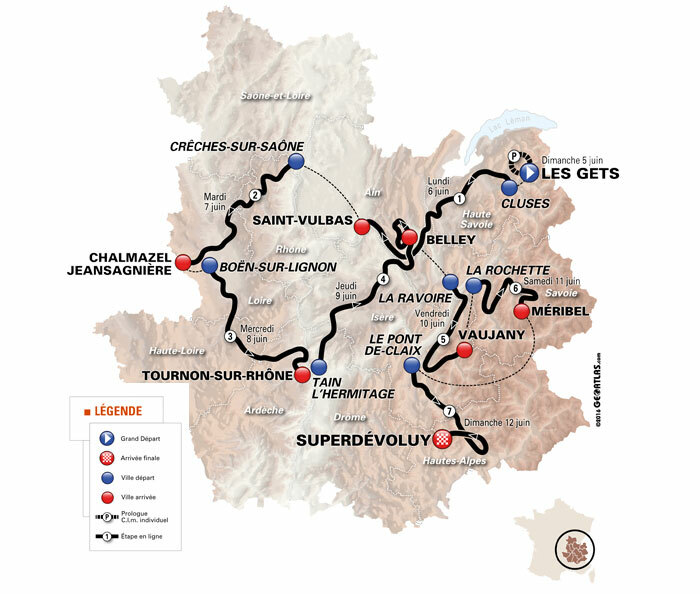 Benefiting from its location and place on the calendar, race organizers often feature a mountain stage with a route that is nearly identical to what the Tour will race one month later. The leader of the general classification wears a yellow jersey with a blue band, distinct from the other racers. As early as 1948 a red jersey with white polka-dots was awarded to the climber because of the mountainous journey of the Critérium. In 1955, a green jersey was added for the best sprinter.